In preparation for an upcoming project that I would usually rent a wet saw for tile cutting (Home Depot’s price is $26/day), but this time I decided to buy a cheap one on sale for $49 at Harbor Freight. I’ve never been impressed with the well used ones I’ve rented in the past, nor am I ever really impressed with the quality at Harbor Freight. That said, the cost to buy is lower than the cost to rent for a couple days, let alone a second and third tile project later this year or next. Another thing I’ve learned over the years is not to skimp on quality blades … they are probably as, if not more, important than the tool. As I started to put the portable wet saw together, I pondered being able to use it, “if need be,” for a small table saw. I will not have access to my large shop cabinet saw with the project I’m planning, so mounting an old 7-inch Nicholson blade might come in handy? I’ll modify the under-guard a bit to make switching blades out easier – at least it looks do-able and likely better than hacking a long rip cut with a saber saw or portable circular saw (at least my lessor quality one). 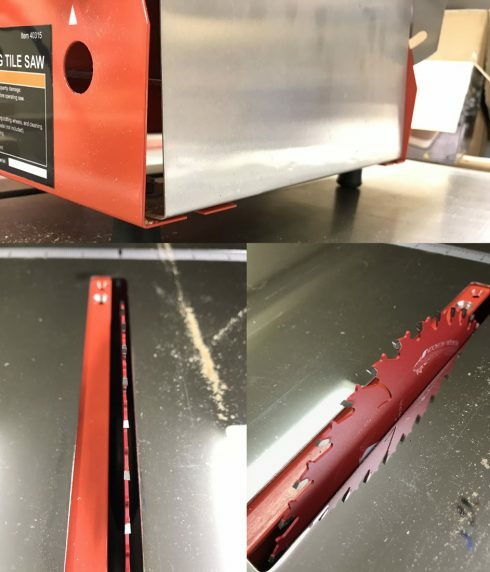 If it doesn’t work well, I’ll just keep the segmented diamond wet/dry blade mounted and use it only for tile cutting I doubt I’ll want to tackle bricks as I did a couple years ago (or 35 years ago #TBT) with this saw though. EDIT: This photo is in the comment below, but would rather have it within the post.